So many things get in the way in the communication process. Whether we are sending a message or receiving a message the same filters/barriers exist. These filters/barriers are speed bumps and hurdles in the perception of the message that is attem pted to be communicated. We will discuss many of these obstacles whether sending or receiving so we can become aware of the misrepresentations and distortions that can take place. Nonverbal Messages – Studies have shown that nonverbal messaging accounts for 93% of communication. Nonverbal communications are messages without words. We live in world that relies on social media to communicate. People make relational commitments, companies make corporate decisions, and countries react to information that communicated through social media. Facial expressions, eye contact, body gestures, and personal space are critical in the interpretation of messages. Facial Expressions – Facial expressions are one of the best indicators of another person’s emotions and feelings. Understanding facial expressions can help us in the communication process. There are several universal facial expressions that we understand; happy, sadness, contempt, surprise, disgust, anger, and fear. Body Gestures – Body gestures are a sure way to view people’s reactions to a message. Depending on the culture and/or environment, body gestures project a message that could easily be misunderstood. Even the use of hand gestures have different meanings; the OK sign, the rubbing of the thumb and forefingers, and thumbs up have significant different meanings. So many things get in the way in the communication process. Whether we are sending a message or receiving a message the same filters/barriers exist. These filters/barriers are speed bumps and hurdles in the perception of the message that is attempted to be communicated. Eye Contact – Our eyes communicate more information than any other part of our body. Depending on the culture, people will generally evaluate messages that are being communicated through our eyes. People who have a prolonged and direct stare could be perceived as being threatening, dangerous, or unsafe. People who can’t look you in the eye can be perceived as having no confidence, guilty, or ashamed. It is good to have eye contact at least 60% of the time in North America. In some other countries, eye contact could be perceived as disrespectful. Personal Space – People use space around them in communicating a message. If people are too close, they may feel uncomfortable. If you are too far away, they may also feel uncomfortable. Space that is within 18 inches is considered intimate space. Emotions – Strong emotions can interfere with what is being communicated in a message. Detaching yourself from another’s emotions can be challenging as well as trying to manage your own. 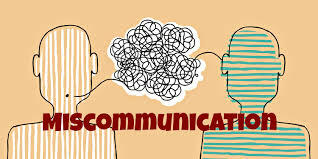 Messages can be better understood if we can separate ourselves form emotions during the communication process. Role Expectations – Our expectations of how someone should act or respond because of their position or title can affect the communication process. Some people may use their role to alter the way they relate to others by positioning themselves higher than others because of a need for power. Others may have a difficult time adjusting or accepting a new position that changes the way of former communication. The Roles of Men and Women – Gender specific roles begin to take shape from early childhood through the adult life. Depending on the culture, boys and girls and men and women are expected to communicate a certain way. Men are generally more competitive and will communicate by using an upper hand to negotiate. Women are generally more support oriented and social in their peace-making role. Semantics – The same word can have multiple meanings. These words appear in our language often, especially in the younger generations. The words “cool” and “hip” have different meanings depending on the usage in conversation. 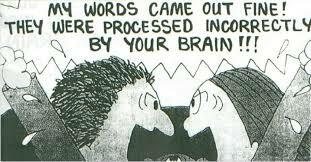 Thousands of slang words can influence the communication process. Copyright © 2017. Dr. James Coyle. iUniverse | All rights reserved.